There's no need to stray far from Russia’s capital to see the country's magical and quickly fading past. Aristocratic, bourgeois and pre-revolutionary architecture abounds, but some of its examples are now on the brink of disappearance. RBTH has chosen five abandoned places that can easily be reached by car. These are five of the many hundreds of sights that are vanishing all over the country as we speak. Built in 1797, it was part of a large architectural ensemble with several buildings and a spacious park. Everything here except for this church was destroyed during World War II. Today it stands alone in the middle of a barren field overgrown with bushes. Under constant threat from vandals, it is kept up somewhat by volunteers that practice off-road bike rides and walks here and check on the place from time to time. 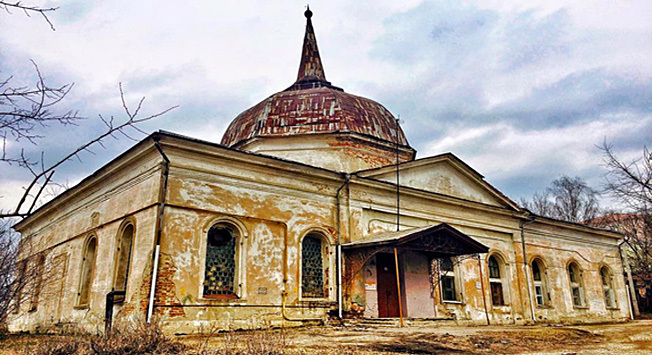 Founded in 1780 by Zakhar Chernyshev, the famous commander from the Seven Year’s War, this church like many others was nationalized by the Bolsheviks in 1917 and later damaged. The neighboring Zagryazhsky estate has been more fortunate: it was carefully restored in the 1960s and today it’s a sanatorium. The grandson of Nicholas I, Konstantin Romanov, received this estate in 1903. The previous owner, Nikolai Shipov, was one of the greatest agricultural innovators of his era. In 1854 he bought 200 cows, hired a specialist from Switzerland and established a cheese factory at Ostashevo. A few years later, the Moscow government recognized Shipov's farm as the best in the country and opened a cheese-making school at the estate. However time has not been kind: the building has been ravaged by vandals, is without windows and doors but is still in good enough condition to be restored. For 300 years it was home to many Russian aristocrats including the Goncharov, Poltoratsky and Gagarin families. When the Poltoratsky family lived here the estate featured more than 50 buildings. There were Gothic houses, a rotunda, a greenhouse, park halls, a bridge and a large cellar. All that remain today are the building's gloomy and dilapidated Gothic ruins, an architectural heritage from the 1840s. The estate has no security and has been looted repeatedly. Situated on the road from Vichuga to the Volga port city of Kineshma, this church, allegedly built in the 19th century, is a jewel among a ring of ruined and forgotten churches. The 30-kilometer journey between these towns features four abandoned dilapidated churches, which are visible along the road. This area is sparsely populated and no restoration efforts are currently underway. Today more than 250 churches in Moscow region require restoration, according to Moscow's eparchy. As of January 2015, more than 1,000 churches in the Moscow region were repaired, 400 of them were built "from scratch". Moscow's eparchy may be the first in Russia to restore all the abandoned churches. According to local authorities, only in Moscow region there are 320 estates, of which 300 are in need of restoration. To solve this problem, the regional government launched a program of preferential lease terms of cultural heritage to investors in exchange for a commitment to the restoration of houses belonging to well-known Russian figures.